Anthony’s beautiful old threshing barn complex high on a hill in rural Radnorshire was coming to the end of its natural life. The farm had long since gone and the corrugated roof had practically disintegrated. The old timber structure was in a parlous state of collapse or near collapse along with dangerous bulging masonry walls which seemed ready to explode at any moment. Planning permission however was in place to create a monumental 660 square meter barn conversion which seemed fanciful to say the least. Anthony contacted Rob at Castle Ring Oak Frame to see if he could see beyond the ruins. After much head scratching and number crunching, Rob agreed to take on his biggest project to date. A thorough and painstaking survey was carried out after which it was decided that the best way to proceed would be to remove the frame in its entirety in order to salvage the preservable timbers by incorporating them into a predominantly new green oak frame. Trusses were prepared, joints patched and strengthened and the new frame constructed in the workshop over many months. Meanwhile, Anthony project managed the rebuilding of the stone walls and underpinning work on site in readiness for the frame. 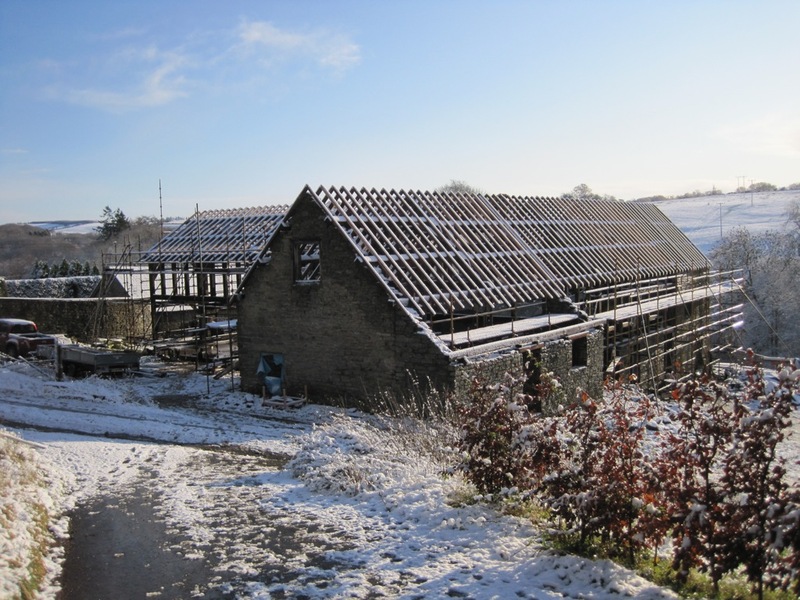 When the frame was finally ready to erect, it took over 2 weeks for the crew and crane, fighting freezing rain and snow to finally restore Gwernaffel to it’s former glory. Good enough for the next 500 years we hope.